High school graduation rates in Saskatchewan have reached a 20-year high, reports the Ministry of Education, with 76.5 percent of grade 10 students in 2017 graduating within three years. 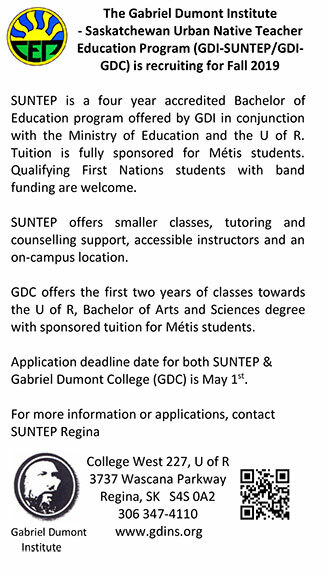 But graduation rates for First Nations, Metis, and Inuit students is significantly lower, at 43.2 percent – up from only 41.9 percent the year before. To examine the discrepancy in graduation rates and what should be done to improve student success, Eagle Feather News spoke with four of the province’s leaders in education: Brent Hills, Superintendent of Education for Saskatoon Public Schools; Sarah Longman, Supervisor of Indigenous Education at Regina Public Schools; Chris Scribe, Director of ITEP; and Carla Beck, MLA for Regina Lakeview. (Responses have been edited for length). Why the discrepancy in graduation rates, and what are some of the major barriers to graduation Indigenous high school students commonly face? BH: It starts with 150 years of oppression and colonial policy, as well as the residential school and Indian Act. Education has largely manifested itself through the omission of the value and contribution of Indigenous people in Canada (...) Barriers such as poverty, hunger, transiency, transportation, health supports – they exist to people of all cultures. SL: We had an Indigenous student forum to talk about some of the realities and experiences in (school). We heard things like some students not having access to technology to complete some assignments. We heard not having their culture reflected in the environment. There need to be more Indigenous people in administrative positions, and more Indigenous teachers (as) role models. They also talked about racism being a factor – sometimes from their peers, sometimes from the structures that were in place. CS: We have to understand the history of education and the model that exists. The model is a system of education where (Indigenous people) weren’t intended to be successful. It was intended to kill us (...) When we talk about drop out rates and barriers, the number one barrier that exists is that Indigenous people are trying to succeed in a system that wasn’t built for us to be successful. CB: What we’ve seen in education since my time here since 2009 with the school board, has been characterized by a lack of direction and lack of sustained effort with education in this province. What I’m hearing from school boards and teachers is that resources have not been there to actually realize these goals. And concerns certainly in the last two budget years that any gains (such as Indigenous student advocates) are potentially in jeopardy because of cuts (to important supports). What is being done to improve graduation rates? BH: Indigenous student advocates is a program created for teachers to provide full time support to Indigenous students in order to help remove barriers that are specific to them. They also help teachers understand challenges their students face. Last year we had quite a few students who spoke about the importance of having an advocate. SL: We implemented a self-declaration process, hitting the community and asking them to voluntarily share information with us (...) we were then able to identify who our Indigenous learners were, and how they were doing. We provided better supports to students in high schools in the most populated schools and brought in our Indigenous advocate teacher program. CS: We’re graduating people to go back in the schools to teach and encourage people to think differently. I wish I could tell you that I’m creating an army of rebels that are going to flip the script on all education. But hopefully what we’re doing is inspiring and starting a spark (...) I hope that helps with the drop out rate – that space is created for out students to say ‘I belong here’. CB: There has been some sustained focus on increasing rate of graduation, and there have been some increased resources brought to tackle the discrepancy (...) but one of my main concerns, though, is the $54 million that was cut from education last year, and only a partial backfilling (...) There’s concerns amongst school boards I talk with that some of these gains might not be able to be sustained. What else should we be doing to ensure the success of high school students? BH: Education can not just be within the four walls of the school. We need to engage our partners and the full community in understanding what Truth and Reconciliation really means (...) It takes a village to raise a child and we are all in this together. The more supports we provide to mitigate those barriers will help kids stay in school. SL: Personally, I’d love to focus more on culturally programming. I’d like to see language taught in schools by fluent language speakers. I’d love to see land based learning taking place. I’d like to see alternative individualized credits (...) I’d love to see our schools filled with Indigenous educators. CS: We tend to forget that parents, in the home communities, play a huge role in education. They don’t always feel as if they’re a huge player, but they’re like the main player. Once you get the support of the community and parents, teaching is easy. Education is easy. Without it, it’s very difficult. CB: It's going to take sustained effort including adequate funding. But that’s not going to be the full measure. We have to continue to make this a high priority for the province, and continue to be curious and creative about solutions.